The new concept could be made available in Australia. 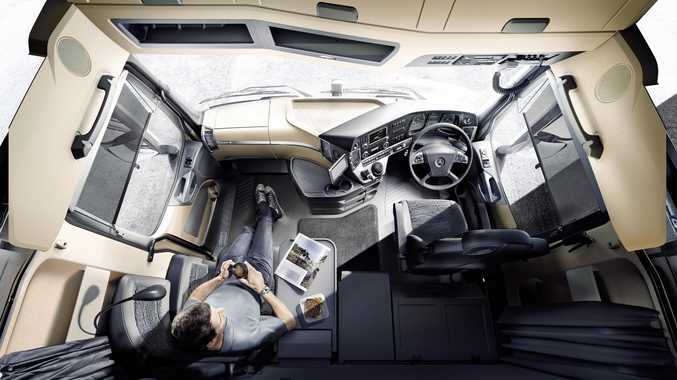 MERCEDES-Benz will reveal a spacious new sleeper cab option concept with an innovative interior cab layout for its new generation truck at the Brisbane Truck Show in May. Customers currently have the option of a fixed 750mm mattress in its large sleeper cab, but Mercedes-Benz is looking at further increasing comfort levels with an even larger mattress and a clever lounge-style passenger seat arrangement. The new feature is called the SoloStar Concept and could soon be available for Australian Mercedes-Benz trucks. The idea of the feature is to maximize the living space of the cab and create two different spaces, one for resting and another for sleeping. When the bed is folded up against the wall, the driver can enjoy a corner lounge-style seat that rests in the back corner of the cab and opens up a vast amount of legroom. The lounge-style seat can be used by the driver during rest stops or can be utilised as a traditional passenger seat. The passenger seat folds forward to allow the large bed, which features a locally-sourced mattress, to fold down. Mercedes-Benz Australia considered the European SoloStar Concept system, but decided its bed was simply not wide enough and subsequently worked to develop a larger bed that would better suit local requirements. The Australian version has also been further developed to include a dual fridge set-up, which sits below a fixed table, as well as a row of cabinets mounted high on the back wall for optimum storage. The SoloStar Concept will be one of several attractions on the Mercedes-Benz stand at the Brisbane Truck Show that will be held at the Brisbane Convention and Exhibition Centre from May 16 to 19.